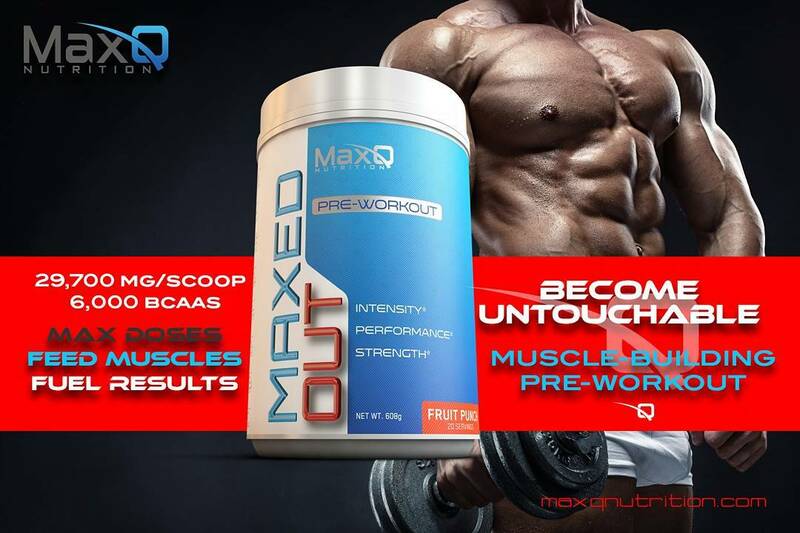 MaxQ Nutrition's Maxed Out Pre Workout – The Fattest Pre EVER? MaxQ Nutrition has crafted a true world beater in their Pre Workout which contains everything you’d want to have a Maxed Out workout! The glory days of the ultra-concentrate micro scoop pre workout are long over. Today, there is an arms race among supplement companies to make the biggest, baddest, most all-encompassing pre workout there is. 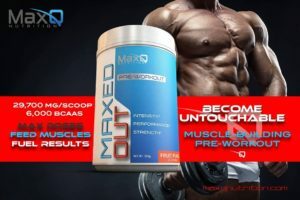 MaxQ Nutrition is a newer supplement company that may have just set the benchmark for single serving scoop size with their Maxed Out Pre Workout. The scoop size rivals that of most protein powders on the market and includes virtually every proven ergogenic you’d want (or need) to support your training efforts. Yep, this one’s gonna get wild and we can’t wait to hear your comments. 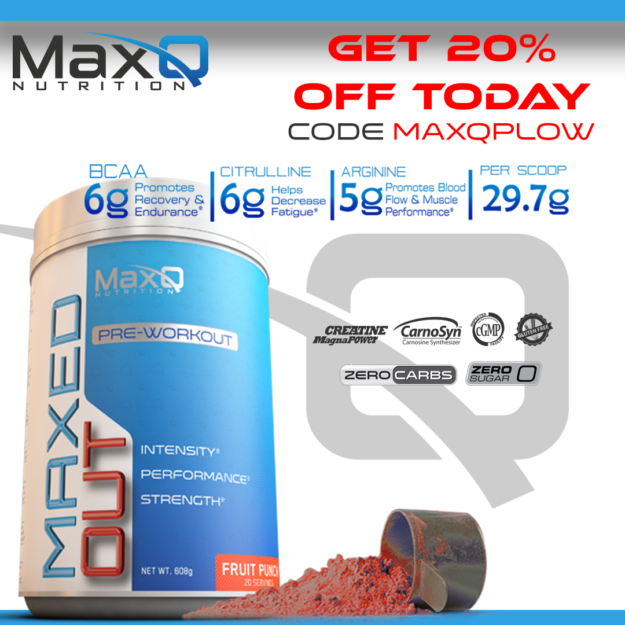 If Maxed Out isn’t available above, see MaxQNutrition.com and use coupon code MAXQPLOW to save 20%! MaxQ has crafted quite the well-dosed pre workout. Each serving weighs in at a monstrous 30g and contains numerous clinically dosed ingredients to power a truly maxed out workout. 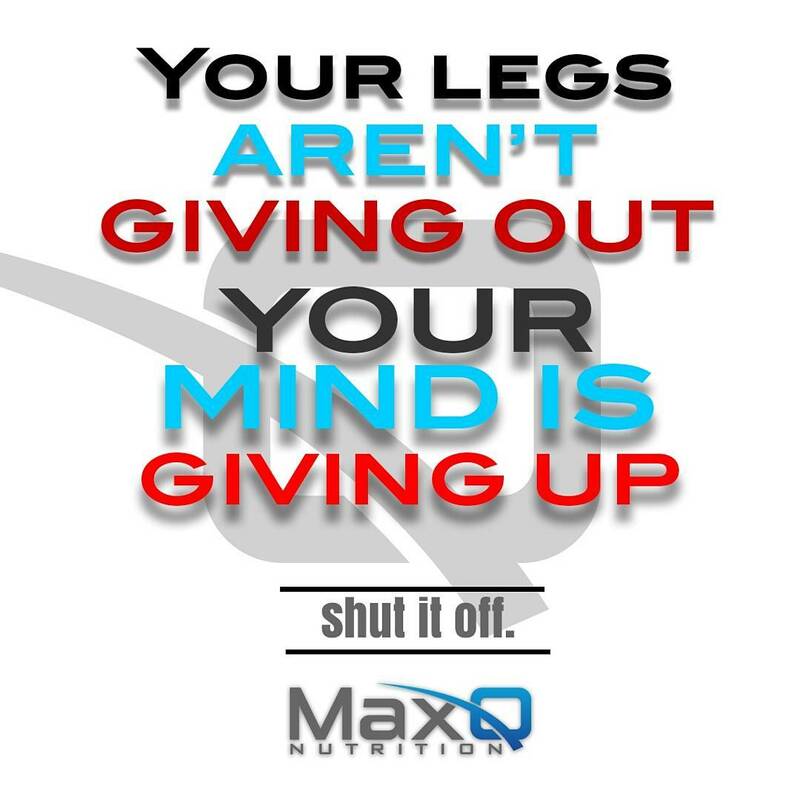 MaxQ Pre Workout is a dynamo in every sense as it delivers everything you’d want in one MASSIVE scoop! Kicking off this beefy pre workout is an equally beefy serving of branched-chain amino acids (BCAAs). Dosed in the 2:1:1 ratio means that each serving provides you with 3g of Leucine, 1.5g of Isoleucine, and 1.5g of Valine. The 3g of Leucine is really significant here, as it’s regarded as the primary stimulator of the mTOR pathway in the body. Stimulating mTOR allows you to stay in an anabolic state, even while working out, to keep building muscle and preventing it from breaking down too much during training sessions. Furthermore, consuming BCAAs around the training window has been noted to speed recovery and reduce DOMS, delayed onset muscle soreness. [2,3,4] This is especially good if you train on an empty stomach. Citrulline Malate is one of the best nitric oxide boosting supplements around. It’s superior to L-Arginine for increasing vasodilation, blood flow, and pumps due to its vastly greater bioavailability. In addition to fueling some truly epic pumps, CitMal also supports better energy production, endurance, and all around athletic performance — plus alleviates soreness. [6,7] You’ve got a solid 6g dose of CitMal 1:1, which gives 3g of pure L-Citrulline to get the blood flowing and veins gorging. Our first of two different forms of Arginine in MaxQ Pre Workout comes via Arginine AKG (AAKG). For a while, it was the go-to choice for boosting nitric oxide (and pumps), but has fallen out of favor due to poor bioavailability and superior ingredients like our previous ingredient Citrulline Malate. ”Arginine has an increased intestinal uptake when paired with an anionic salt such as alpha-ketoglutarate. Therefore, adding AKG boosts arginine in the system. So, in order to maximum available arginine, we chose dosing for AAKG at moderate levels and added the recommended maximum per dose of Arginine. Now, with our pre-workout, we you have citrulline, arginine and increased bioavailable arginine working to get the vasodilation in order as well as extend the benefits offered by arginine. Well put. A few of our veteran users out there say they miss the effects from arginine, so if you’re one of them, then Maxed Out’s definitely for you… and we’re not even close to done yet! 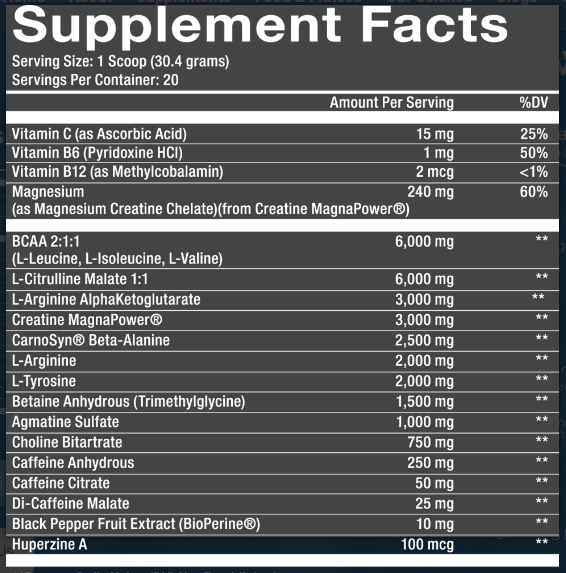 Also known as Magnesium Creatine Chelate (MCC), Creatine MagnaPower is a patented, trademarked form of creatine developed by Albion Nutrition. With MagnaPower, creatine is chelate bonded to a magnesium salt to enhance absorption and bioavailability in the body. Most current research indicates that MCC isn’t any better than creatine monohydrate in terms of boosting strength or power, but we’re ok with its inclusion due to the additional magnesium it contributes — since most of us are deficient in it to some extent. Beta alanine is well documented across a wide range of sports and athletics to significantly improve power, strength, and endurance while at the same time reducing fatigue. ”Arginine is often equated with ‘pump’, and is a vasodilator. It opens up blood vessels and improves blood flow. The reason for this is that arginine is a precursor for nitric oxide (NO) synthesis—it is biosynthesized in the body from arginine, oxygen, and a phosphate called NADPH—which requires folic acid to work properly. Arginine is absorbed in the intestines. During the NO production process, citrulline is a byproduct of this cycle, and the body simply recycles citrulline back into arginine in the kidneys. So, you may ask why add both citrulline and arginine if they essentially convert back into each other in this endless cycle? That’s where we studied synergy for our formulation. Our studies supported the theory that when our vessel cells are provided with more of the aminos and/or nutrients that produce NO, it has more resources to work with, and thusly will produce more NO. Here’s why: Arginine supplementation increases plasma levels while citrulline extends the life of those plasma levels. Tyrosine is a widely used focus and mood elevator in pre workouts, but rarely do we encounter it at a rather impressive 2g dose. If we’re lucky, we’ll get upwards of a full gram — it’s few and far between that we get into the clinical dosing range of 2g…wooo weee! Tyrosine is a potent nootropic that boosts cognition and focus while also alleviating signs of stress and anxiety. [13,14] If you’ve never felt much from Tyrosine before, get ready, you’re going to feel this one! 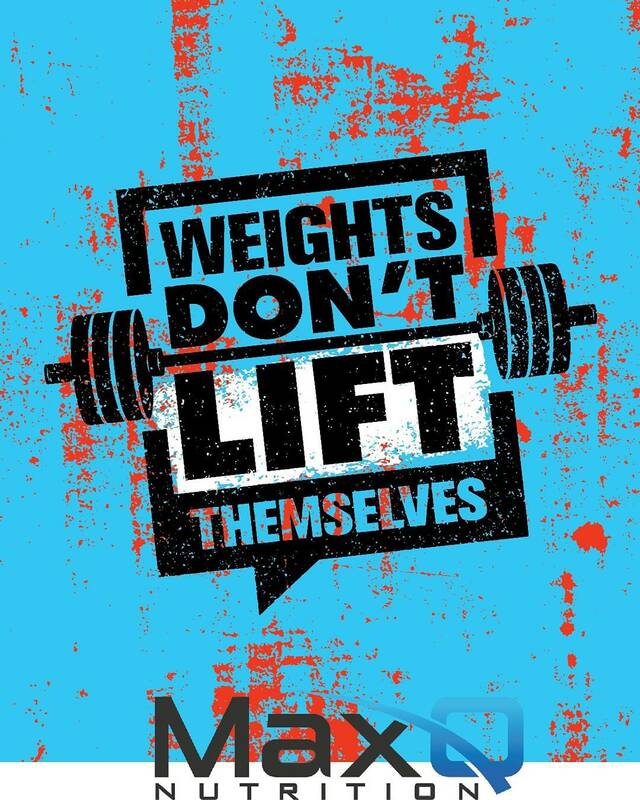 Weights aren’t going to lift themselves, get in the gym and DO WORK! The ergogenics in MaxQ’s Pre Workout keep rolling in with our next one — Betaine anhydrous, a.k.a. trimethylglycine (TMG). Derived from sugar beets, betaine has a proven track record of enhancing power, strength, and endurance. 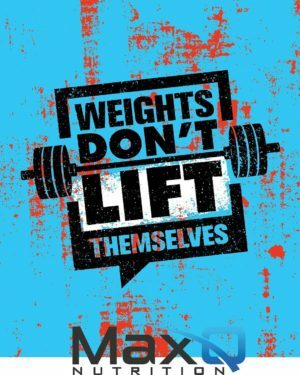 [15,16,17] It also helps reduce soreness and supports the body’s own production of creatine too! The clinical dose is 2.5g, which we’re short of here, but may show up in MaxQ Nutrition’s soon to be released Post Workout supplement. Even more pumps?! You bet your sweet baby biceps there’s more pumps coming! While Citrulline Malate provides the initial boost in N.O. for your workout, Agmatine keeps it going all throughout your workout, ensuring your pumps never deflate! Agmatine inhibits arginase, the enzyme responsible for the degradation of arginine in the body. It also functions as a neurotransmitter / neuromodulator too, which gives some added focus boosting properties to Agmatine! The Agmatine + Citrulline combo used here is one we’ve experienced before, and quite honestly love for the dense and powerful pumps it provides throughout the workout. The 1g dose is impressive and on the higher side of pre workout supplements — often times, brands will only include 500g or so, which is “decent”, but 1g really shines. 1 scoop of Pre Workout and you’ll be untouchable in the gym! Choline bitartrate is another proven focus aide in pre workouts that’s best known for its ability to strengthen the ever-important “mind-muscle” connections. The bitartrate form has lower bioavailability and absorption compared to more bioavailable choline forms, such as Alpha GPC, meaning you’ll probably need a higher dose of the bitartrate form to really notice its effects. 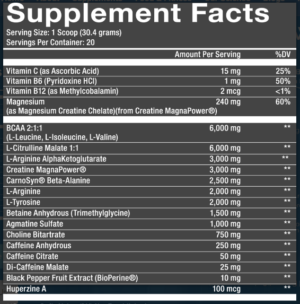 The 750mg dose here is one of the higher doses we’ve seen lately when bitartrate is used in supplements. More and more though, we’re noticing companies opting for the superior Alpha GPC, but we’ve also never compared it to a dose this high of the bitartrate form. 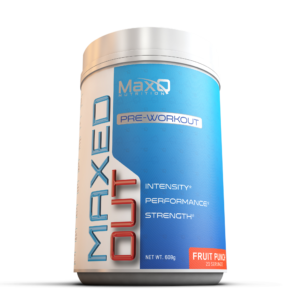 We’ve got not one, not two, but THREE forms of caffeine in MaxQ Pre Workout, led off by the fast acting caffeine anhydrous. 250mg is no minor dose, and will provide a steady kick in the pants to get going for your workout, but we’ve still got two more forms to go! 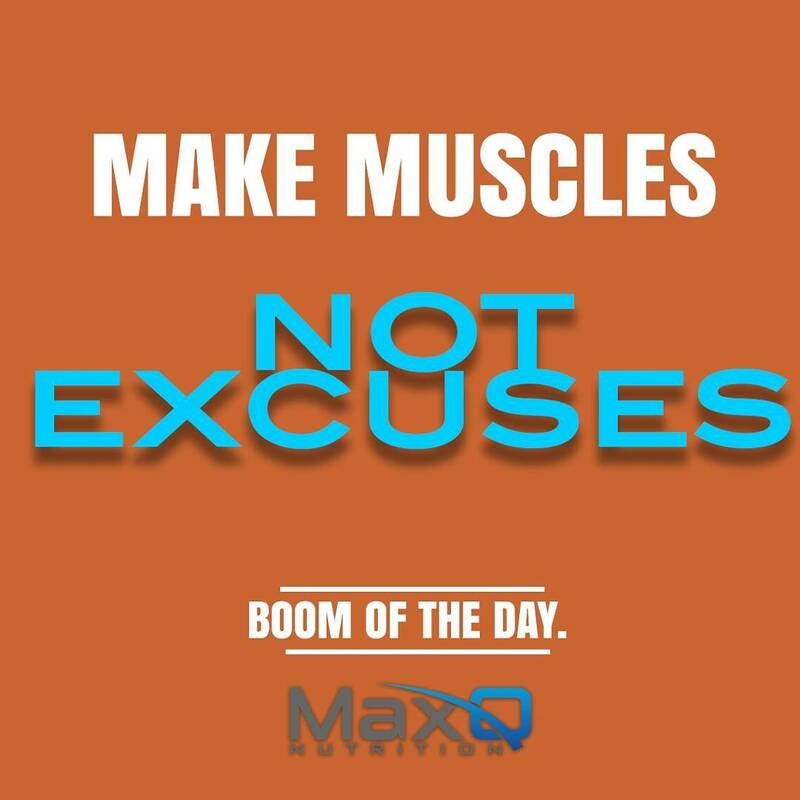 MaxQ Nutrition Pre Workout supplies everything you need to support optimal muscle growth heading into a grueling workout. Next up is caffeine citrate — a combination of pure caffeine and citric acid (citrate). Caffeine citrate is a smoother form of caffeine that also only packs 50% caffeine by mass, which means that you’ll get an additional 25mg caffeine here. So far that adds up to 275mg caffeine per serving, but we’re not quite done with the energy component yet! Our third and final form of caffeine is dicaffeine malate. It’s formed from a combination of malic acid (malate) and caffeine. It yields roughly 73% caffeine by mass. Here, that adds up to another, which adds an additional 18.25mg caffeine. For those of you playing along at home, that means our grand total of caffeine comes to 293.25mg per serving. The combination of all three forms will give an immediate surge of energy to get out to a fast start and have the long-lasting energy to sustain you throughout the duration of even your toughest workouts. 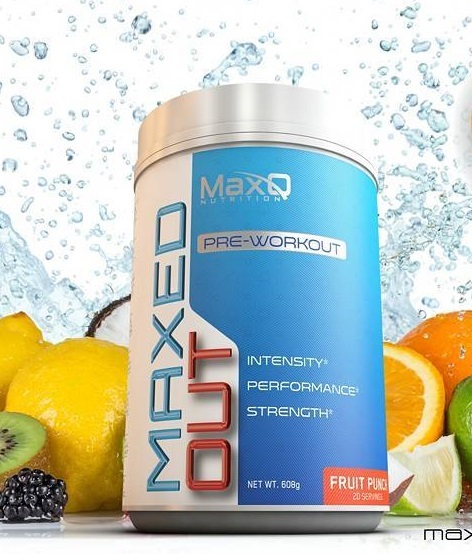 There’s a TON of actives in MaxQ’s pre workout, and to ensure that your body will put it to good use, MaxQ Nutrition has included 10mg of the nutrient absorption enhancer BioPerine. This patented black pepper extract prolongs the lifespan and boosts bioavailability of the other ingredients here by inhibiting enzymes that would otherwise prematurely breakdown the useful ergogenics. 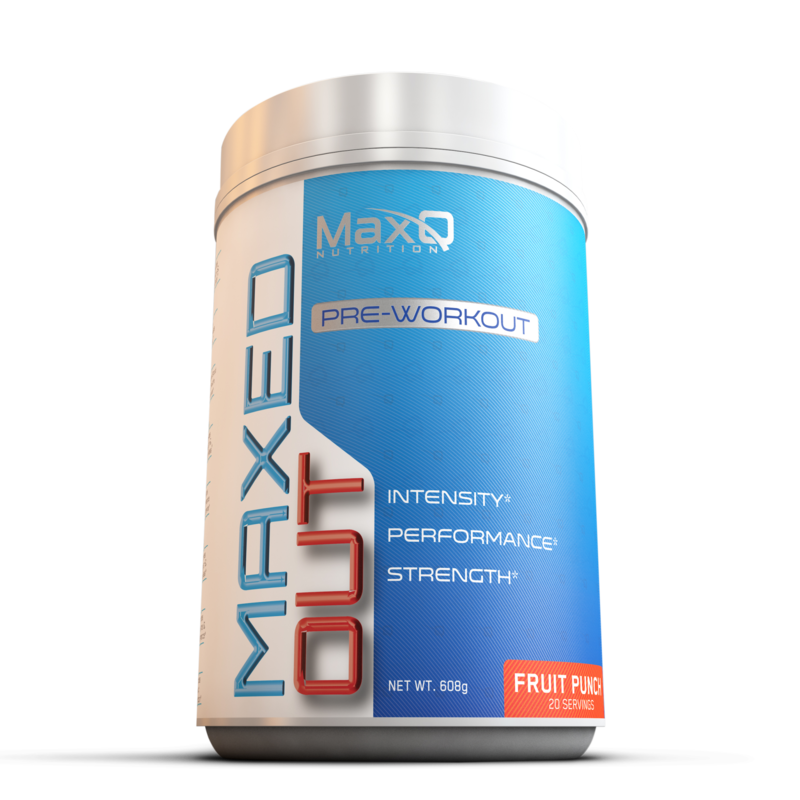 Currently MaxQ Pre Workout only comes in Fruit Punch flavor. Hopefully more will continue to roll out. Finally, we have the acetylcholine-sustaining nootropic Huperzine A. Also known as Toothed Club Moss, Huperzine sustains acetylcholine levels in the body by inhibiting acetylcholinesterase, the enzyme that degrades acetylcholine. Huperzine prevents acetylcholinesterase from kicking into action, resulting in more available acetylcholine. The takeaway is that Huperzine is an indirect booster of acetylcholine that yielder vastly improved focus. One last thing to mention is that huperzine protects the brain from the “neuron death molecule” glutamine, and can possibly help create new brain cells thereby making it “neurogenerative”. 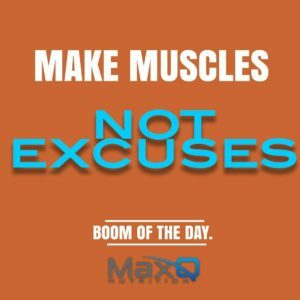 ”The MaxQ Nutrition founders have worked with countless professionals in diverse athletic fields–from the IFBB Pros and NFL to the NHL and Ironman competitors. They also have their own backgrounds in competing and training. The formulation of the products relied heavily on professional athlete input and professional sports approved ingredient compliance. That’s why you won’t find a ton of “smoke and mirrors” stimulants. They aren’t necessary for a preworkout—feeling “insane” isn’t the purpose of a preworkout—its boost intensity, performance and strength. Not many stims are approved by pro sports for that reason. MaxQ currently only has one flavor available for their Maxed Out Pre Workout — Fruit Punch. Hopefully, as the brand continues to grow, so will the number of flavors. It truly is a golden era in the pre workout landscape. The number of transparently labeled, clinically dosed products is higher than ever before, and from our view, will only keep increasing. The big decision for you, the consumer, is going to be the stimulant load in each one. Those that like the “cleaner” feel of just caffeine will find a bonafide winner in MaxQ’s Pre Workout. Those of you that want to “crazier, more exotic” stim kick can check out our Best Pre Workout Guide to choose your pleasure! Before we go any further, take a moment to sign up for PricePlow alerts and receive the very best deals from around the web, but you should also see their website below and use our coupon until we see it out in our stores! 13 Comments | Posted in New Brands, New Products, Supplement News | Tagged AAKG, Agmatine Sulfate, Arginine, Arginine AKG, BCAA, Beta Alanine, Betaine, BioPerine, Black Pepper Extract, Branched Chain Amino Acids, Caffeine, Caffeine Citrate, CarnoSyn, Choline Bitartrate, Citrulline Malate, Creatine, Creatine Magnapower, Dicaffeine Malate, Huperzine A, Isoleucine, L-Tyrosine, Leucine, MaxQ Nutrition, Pre Workout, Pre Workout Supplements, Valine.